PLACE A PRINT AD and get FREE TICKETS TO CONCERTS! That’s right . 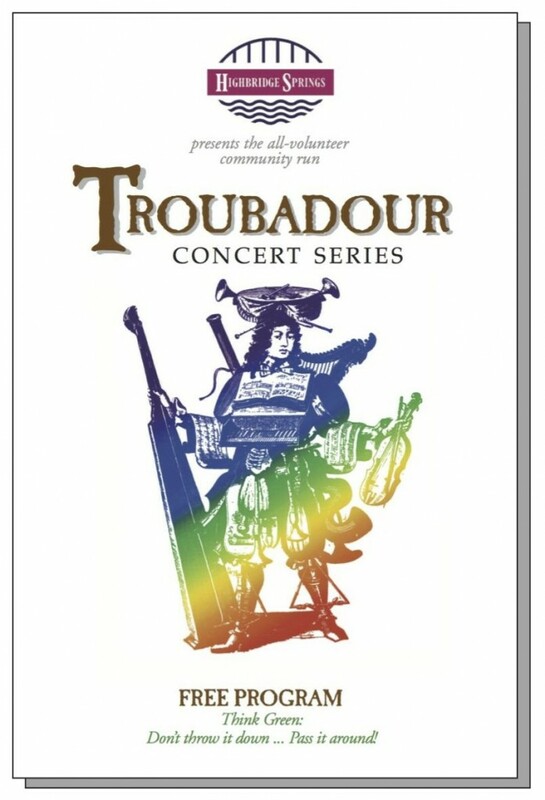 . . simply PRE-PAY an ad in the next printed program for the TROUBADOUR CONCERT SERIES and you will get TWO FREE TICKETS or Discounted Prime Seats for every concert covered by that program issue (usually 8-10 concerts). You ad will be seen ALL YEAR LONG at every Troubadour Concert. AVERAGE READERSHIP: 40,000+ per issue. We prefer camera ready art as a color PDF file. To have the TROUBADOUR CONCERT SERIES create your ad, please ad a $35 set up charge. You can email your files to TroubaConcert@aol.com but make sure to include all contact information in your message. Copyright © 2019 Troubador Concert Series. All rights reserved.